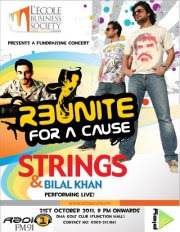 On the Launch of L'ecole Business Society, We Bring to you a Fund Raiser Concert, Featuring Strings and Bilal Khan Live in Concert. Don't miss the Grand Opening by Our very own student based band HORIZON. The revenues earned from the event will be used for the people suffering and left starving and homeless by the Flood that has hit Sindh. We can jointly make this effort to make a little difference which may help a few by saving and rebuilding their destroyed lives!